Yahoo has released Yahoo! Mash in what appears to be the closest thing to a Facebook-MySpace clone that I've seen coming from Yahoo. Initial impressions seem to indicate that it's not much different than Facebook at all and many individuals are happier using the older social network. On WebmasterWorld, moderator martinibuster points out from a NY Times blog that the differentiating feature of Yahoo! 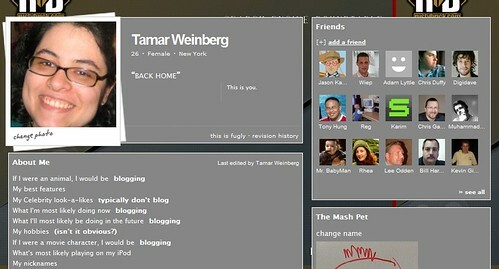 Mash is that profiles can be edited by multiple users. But others think that this is a plus, because you'll only be adding true friends, not people who would blatantly edit your profile. Also, some elements of other users' profiles cannot be altered (I tried. No luck). For those who don't have access yet, here's a preview of my profile. Previous story: Google Webmaster Tools Not Showing PageRank Pages for Some Sites?